The gut-brain axis is undeniable, but specific mechanisms of influence continue to be investigated. Specifically, the gut microbiota is now considered the body’s major neuroendocrine system, controlling body processes including the stress response and the hypothalamic-pituitary-adrenal (HPA) axis. Back in the early 20th century, Nobel laureate, Ilya Metchnikoff, observed that the growth of cholera could be reduced by some microbes and enhanced by others. He proposed that commensal bacteria within the intestine could contribute to protection against this pathogen and alteration of the gut bacteria could prevent disease. 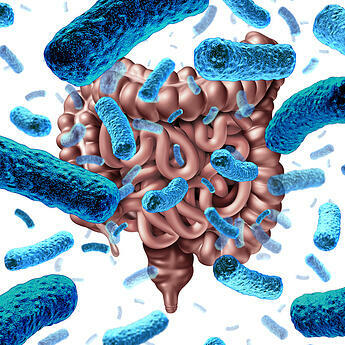 In 2001, Nobel Prize winner Joshua Lederberg coined the term “microbiome”. The microbiome is the “ecological community of commensal, symbiotic and pathogenic microorganisms” that can be found on mucosal surfaces, including the eye, mouth, lungs, and the gut. Recent research reviews the connection between the microbiota and the neuroendocrine system. The article is a review of the literature showing the connection of the microbiome to remyelination, microglia function, diseases like multiple sclerosis (MS), recovery from spinal cord injury and even behavior. The article cites research that links MS with intestinal permeability. Other research shows a link between the microbiome and pediatric MS, suggesting a connection between myelin production and metabolites produced by gut microbes (particularly p-cresol). Short chain fatty acids from the bowel flora (especially butyrate) affect remyelination, microglia function, and also oligodendrocyte differentiation. In the autoimmune disease, neuromyelitis optica, research shows there may be a connection to bowel ecology. Another study showed the connection between CNS inflammation and the gut microbiome in mice. We have not yet gotten to the point where we can identify specific bowel microbes and specific diseases. One study, however, has taken a step in that direction. It found that recolonization with wild type B. fragilis maintained resistance to experimental autoimmune encephalomyelitis, whereas reconstitution with polysaccharide A-deficient B. fragilis restored experimental autoimmune encephalomyelitis susceptibility.